India Mentioned As One Of The Biggest Emitter of CO2 Globally. India’s increase in CO2 emissions topped all other major emitters. GLOBAL EMISSIONS of carbon dioxide are all set to register an all-time high in 2018, driven by a strong growth in emissions from India, according to the latest annual report of the Global Carbon Project. GREENHOUSE gas emission with carbon dioxide being the major gas is set to break another record in 2018 and the major emitter is India. That is according to a new report released by the Global Carbon Project. Indi is ranked as the third-biggest emitter of CO2 in 2018 after the United States and China at the top of the list. There is a likely rise of 6.3% in carbon dioxide emission in India this year compared to the last year. The report also mentioned that the total emissions will total to 2.62 billion tonnes and added that India has recorded the highest rise in carbon dioxide emission globally. Global statistics show that the total world’s carbon dioxide emission is likely to reach 37.12 billion tonnes, an increase of 2.7% from the last year’s total emissions. The report emphasized that the world has a whole experienced a slow growth from 2014 to 2016. However, there has been a rapid rise in carbon dioxide emission in the past two years. 1.6% rise was recorded in 2017 and now 2.7% in 2018 on average with a possibility of reaching 3.7%, almost a double increase. The tonnage expected this year is 37.1 billion tonnes with an error of plus or minus 2 billion tonnes. This figure is likely to rise even further in the coming years as the report did mention. China is still the leading carbon dioxide emitter of the world with its total emission in 2018 projected to reach 10.3 billion tonnes, a whopping 4.7% increase from the previous year’s emissions. China is followed by the United States which only emits almost half the China’s total emissions (5.4 billion tonnes which implies a rise of 2.5% from that of the previous year). India’s total carbon dioxide emissions increased by 3.7% from the previous year’s statistics. This increase is much lower than the average yearly emissions over the past decade of about 6%. The report said that the fall in the emission rate is due to the demonetization and GST. 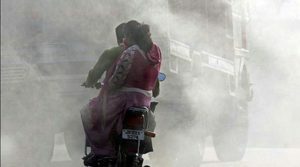 The rise in greenhouse gases emitted by India is attributed to the rise in economic growth that India is undergoing. “India’s economic growth is on the rise with an average of 8% in the past two quarters of this year. While the plans for renewable sources of energy are still underway, coal consumption is on the rise as the mining continues to expand to provide enough raw materials to the existing power stations which have been running short of the coal supply in the past,” the report states. India’s carbon dioxide emission is significantly going down as the country embarks on the implementation of renewable energy sources. The past decade has seen the emission per GDP decreasing each year. The report stated that the rise in global carbon dioxide emission could jeopardize the Paris Agreement key objective of maintaining the rise in temperature to within 2 degrees centigrade of that of pre-industrial revolution. According to the Intergovernmental Panel on Climate Change (IPCC), the CO2 emission should reduce to 20% by 2030 and hit the minimum zero by 2075 if the global warming is to be limited to <2 degrees centigrade. To keep the temperature rise to <1.5 degrees centigrade, the CO2 emissions should be reduced by 50% by 2013 and hit the zero mark in 2050. The goal of reaching the zero carbon dioxide emission by 2050 seems unrealistic as at now since we are still using the carbon-dependent technologies as well as the economy constructs of the 20th century. The report was very clear on that.